Craig Capurso is a Wall Street trader and a victor on the bodybuilding scene. As his victories mount and the stages get bigger, Craig inches closer to being the biggest bull on the market. Craig Capurso will surprise you. He's big, ripped, and he's sharp as a tack. Not only is Craig an IFBB Physique Pro, but he's a successful Wall Street commodities trader with a heart of gold and the work ethic of a champion. "I was one of the smart guys," Capurso says, "and that's what took me into the trading arena. I am a fitness guy, but I'm also a business guy." Craig's first foray into professional fitness came with a win at the 2009 Fitness Atlantic in Connecticut. He won 6 of his first 11 events. Recently, this fit businessman won the Bodybuilding.com 2012 BodySpace Spokesmodel Search. "I always want to better myself," Capurso says. "I wanted to better the 2010 person I used to be. 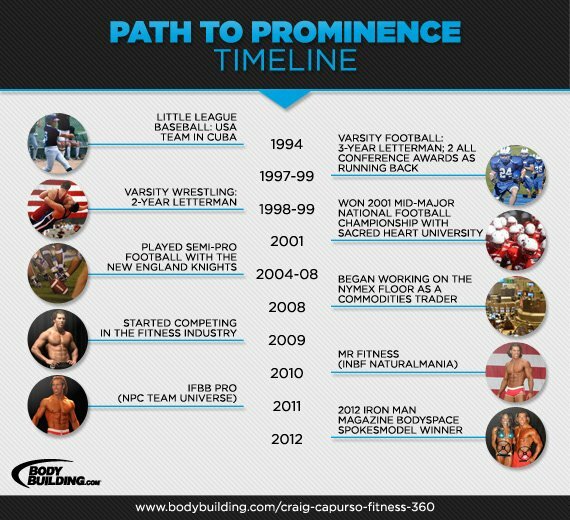 I want to better the 2011 (I just made IFBB Pro), what am I going to do in 2012?" We aren't fortune tellers. We can't say Craig will win this year at the pro level. We don't dare anoint him the next big thing. But we will stand by him, and not just because of his physique. Capurso has the 'it' factor. He understands that the stage is bigger than one man. He understands the repercussions of victory, the pressure and press that come with it. We know he'll represent Bodybuilding.com with class. We trust him to speak for us. Don't believe us? Ask him yourself. "I'm always about giving back," Capurso says. "I always hit my fans back. If you message me on Twitter, Facebook or BodySpace, or any of the other social networks I have, I'm getting back to you. I don't hide behind an alias. I'm on all those websites. It's about giving back. It's about inspiring everyone around you. It's about spreading the fitness lifestyle." Craig asks you to heed this warning: Don't become a private lab rat for supplement companies. Supplements are a good part of the program if you use them right. Cardio isn't the devil, nor is it some altar for ritualistic sacrifice. Craig uses boxing training techniques, which promote both heart health and power. What is more important to you right now? Bodybuilding or Finance? I have always been a self-disciplined, proactive individual. As a floor trader, we wait for the market to dictate our next move. One may say we are more reactive than proactive. I find that this conflicts with who I am as a person. I also notice that in my current position, the only way for me to make more money is by taking more risk. With the introduction of electronic trading and the OTC markets, the risk reward has never been worse. I work hard to get ahead and make strides in my career and on my physique. Being a floor trader, you can work as hard as you want and the risk reward will not change, so I am beginning to rethink my next career move. The reason I state all these facts is because a question was posed: Is there a point in which I may walk away from the trading arena? The answer is yes! I have currently found a way to balance my passion for fitness side-by-side with trading on the floor. However, I have thought of what it would be like to solely attack a career in fitness and acting with the same tenacity that I have attacked other completed goals. I will use my current income structure to help support an education in acting. I have attended acting classes at T Schreiber's Studio and believe my next stop will be an improv class and more acting coaches and schools throughout the city. I am a big believer in building a foundation from the ground up. I always preach education with fitness and I believe the principles can be applied to any facet [of life]. So I will certainly educate before I take a leap of faith but, as a smart business man, I wouldn't leave without having some type of financially off-setting structure set up. Was it awkward transitioning into a non-team sport? I do not like competing in anything where there cannot be a clear winner. I like football because at the end of the game there is a winner and a loser. I have always played competitive sports for this reason. Boxing was great because it was just two of you. I, however, saw the bigger picture and put my pride aside as I entered the competition arena. I now compete and you can make an argument for nearly every single guy to win. It takes some getting used to, but I have been able to come out on the winning side. You may call it a good run or I have the look the judges want; whatever it is, I am thankful for all I've been able to achieve thus far. I also know that I will not be the flavor of the month forever, so I will certainly be expanding my reach beyond just the competition stage.